Modiphius Entertainment announced today they are developing two unique tabletop roleplaying game products based on the Fallout® videogame franchise. 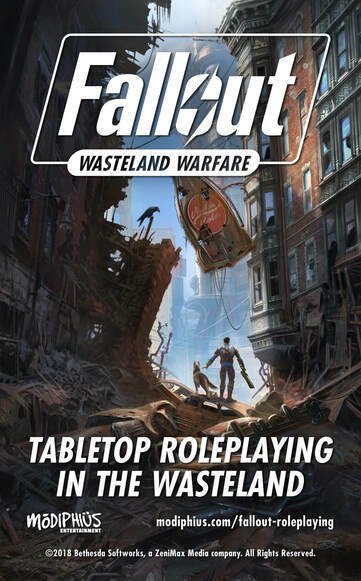 Modiphius will develop and publish two tabletop RPG titles: the first expanding on the narrative wargame experience of Fallout: Wasteland Warfare, their licensed tabletop miniatures game, while a second more traditional tabletop RPG will follow using the company’s 2d20 System. Modiphius Entertainment has had great success with their recent licensed roleplaying games using the 2d20 System: Infinity: The Roleplaying Game, a roleplaying game based on Corvus Belli’s Infinity miniatures game; Conan: Adventures in an Age Undreamed Of, based in the world of Robert E. Howard’s novels; and Star Trek Adventures, under license from CBS Studios Inc. Last year, Conan: Adventures in an Age Undreamed Of won Best Roleplaying Game at the UK Games Expo awards, and Star Trek Adventures won three ENnies for Best Rules, Best Miniatures Product, and Best Production Values. The Fallout: Wasteland Warfare miniatures game has already proved a smash hit with fans of the hobby and Fallout franchise. Released in August it features a huge range of highly detailed 32mm scale resin miniatures plus rules for narrative wargaming in the wasteland with co-op, vs and solo modes of play. Fallout: Wasteland Warfare game designer James Sheahan is developing a roleplaying game expansion for the miniatures game which will include new rules for character creation, creating adventures in the wasteland, and more. Long-time fan, and head of roleplaying game development at Modiphius Entertainment, Sam Webb (Star Trek Adventures) will lead development of the 2d20 System version for a more in-depth tabletop roleplaying game experience. 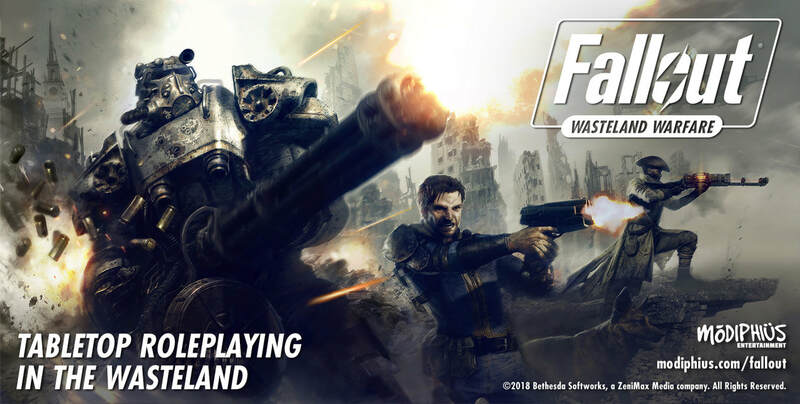 FALLOUT: WASTELAND WARFARE – TABLETOP ROLEPLAYING IN THE WASTELAND! Designed for 1 Gamemaster and up to 6 players, aged 14 and up. Build your crew from a wide range of factions, allies and iconic characters from the Fallout series, or even create your own, and play in apocalyptic roleplaying adventures across the wasteland. The Roleplaying Game Expansion will let players take the popular narrative experience of the Fallout: Wasteland Warfare miniatures game even further, by expanding their collection. Alternatively, it can be played as a standalone product using free downloadable cards and a set of the Fallout: Wasteland Warfare dice available from all good gaming stores. Players explore the desolate wasteland of the Fallout universe, fight terrifying mutated creatures and encounter the denizens who make the wasteland their home. Delve into abandoned Vaults, ruined cities, strange facilities, and antiquated military bases. Encounter Super Mutants, Raiders, Survivors, Vault Dwellers, the Brotherhood of Steel, the Institute and the Enclave, and many more! Will you roam wide and far, or build up and protect your settlement? For those who want to create their own unique characters, use the faction based Archetype cards to start your own hero and see them grow from adventure to adventure. 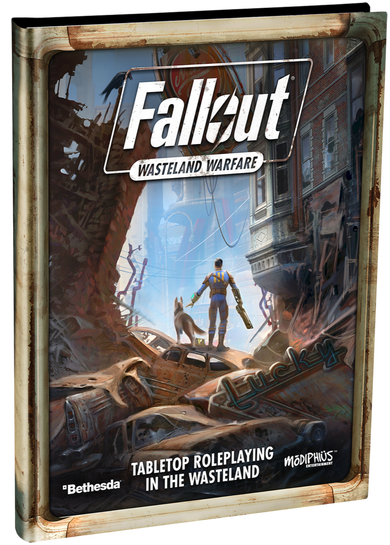 Complete rules for tabletop roleplaying in the wasteland, based on the popular Fallout: Wasteland Warfare miniatures game. Full rules for character creation, archetypes and original player ideas alongside existing characters from the Fallout universe. Packed with lots of full colour photographic scenes of the Fallout: Wasteland Warfare range to inspire your adventures! Interact with familiar characters and creatures drawn from the world of Fallout. Background on the locations and factions that players can encounter. Advice and tools to help gamemasters create and run exciting new adventures in the Fallout universe. This is designed as an expansion for the Fallout: Wasteland Warfare Two Player Starter Box however a complete stand-alone boxed set will be available for Christmas including cards, dice, and rulebook for those who prefer everything in one package! ZeniMax Media is a privately owned media organization headquartered outside Washington DC with international publishing offices in London, Paris, Frankfurt, Eindhoven, Hong Kong, Tokyo, Sydney and Moscow. Through its subsidiaries, ZeniMax Media creates and publishes original interactive entertainment content for consoles, PCs, and handheld/wireless devices. ZeniMax Media divisions include Bethesda Softworks, Bethesda Game Studios, id Software, Arkane Studios, Tango Gameworks, MachineGames, ZeniMax Online Studios, ZeniMax Europe Ltd., ZeniMax Asia K.K., ZeniMax Asia Pacific Limited, and ZeniMax Australia Pty Ltd. For more information on ZeniMax Media, visit www.zenimax.com.